TypeScript supports parameterized types, also known as generics, which can be used in a variety of scenarios. For example, you can create a function that can take values of any type, but during its invocation, in a particular context, you can explicitly specify a concrete type. Take another example: an array can hold objects of any type, but you can specify which particular object types (for example, instances of Person) are allowed in an array. If you were to try to add an object of a different type, the TypeScript compiler would generate an error. The following code snippet declares a Person class, creates two instances of it, and stores them in the workers array declared with the generic type. Generic types are denoted by placing them in the angle brackets (for example, ). Here we declare the Person, Employee, and Animal classes and a workers array with the generic type . By doing this, we announce our plans to store only instances of the class Person or its descendants. An attempt to store an instance of an Animal in the same array will result in a compile-time error. After using generics in Java for 10 years, I quickly noticed that the syntax is the same and was about to check off this syntax element as “got it”. But it was a little too soon. While Java, C++, or C# use nomimal type system, TypeScript uses the structural one. In the nominal system, types are checked against their names, but in a structural system by their structure. With a structural type system, as long as the structures of the type are similar, you may get away with assigning an object of one type to a variable of another. 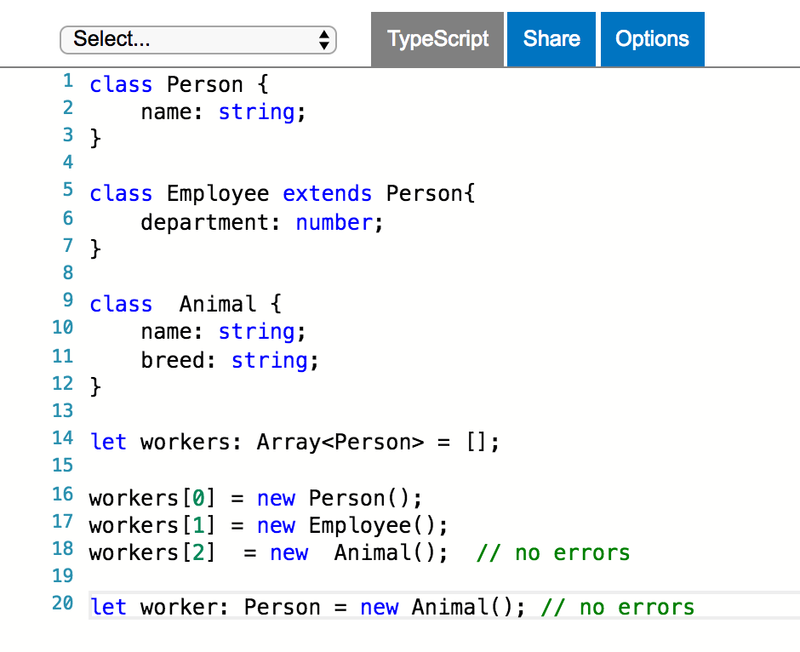 Let’s illustrate it by adding the property name to the class Animal as seen on the screenshot below. Can you use generic types with any object or a function? No. The creator of the object or function has to allow this feature. If you open TypeScript’s type definition file (lib.d.ts) on GitHub and search for “interface Array,” you’ll see the declaration of the Array, as shown below. You can create your own classes or functions that support generics as well. In the next listing, we defined an interface Comparator that declares a method compareTo() expecting the concrete type to be provided during this method invocation. If you live in New York, stop by at the Java SIG meetup on August 23, 2017 where I’ll be delivering a presentation “TypeScript for Java Developers”.